Nankhatai also called Indian shortbread cookies or biscuits. They are made with flour, sugar and ghee or butter. 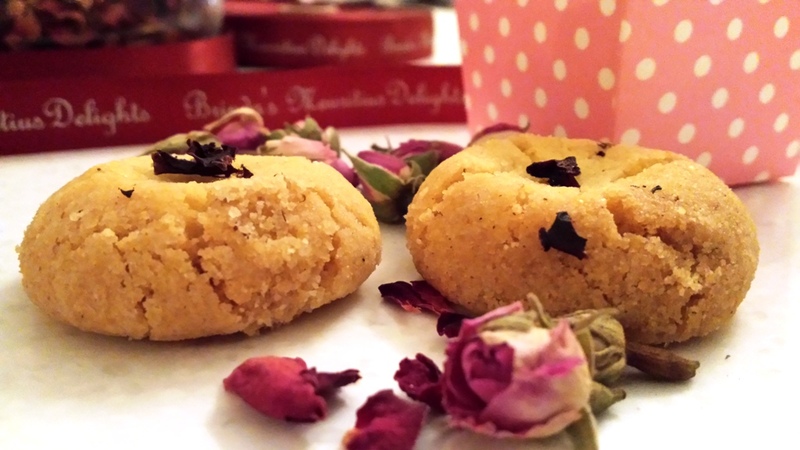 There are many variations of Nankhatai, some recipes use half suji” or semolina and half flour. They can be made in different flavours as well from plain to a selection of flavours of your choice – see my note below. 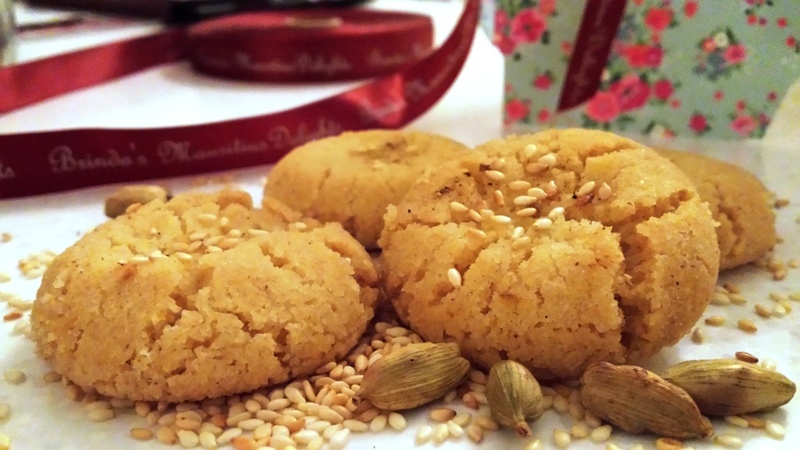 Nankhatai is an Indian cookie which is a favorite in most Indo-Mauritian families. They are usually made for most celebrations such as Diwali & Christmas. In Mauritius they are even served individually wrapped as wedding cakes in Indian weddings. Few drops rose spice drops (I used Holy Lama spice drops) but if you cannot get hold rose essence is fine. Cream the ghee and castor sugar using until light, smooth and creamy. In a separate bowl sift the dry ingredients – flour, semolina, cardamom powder, nutmeg powder and baking soda. Start adding the mixed dry ingredients – Using a wooden spoon mix well to incorporate all the ingredients. At this stage add the flavorings essence you’ve chosen. Using your hand gently knead to a smooth dough. Pinch medium sized balls from the dough roll them evenly in your palms. Slightly flatten them, using your thumb press slight in the middle forming a little dent in the middle. 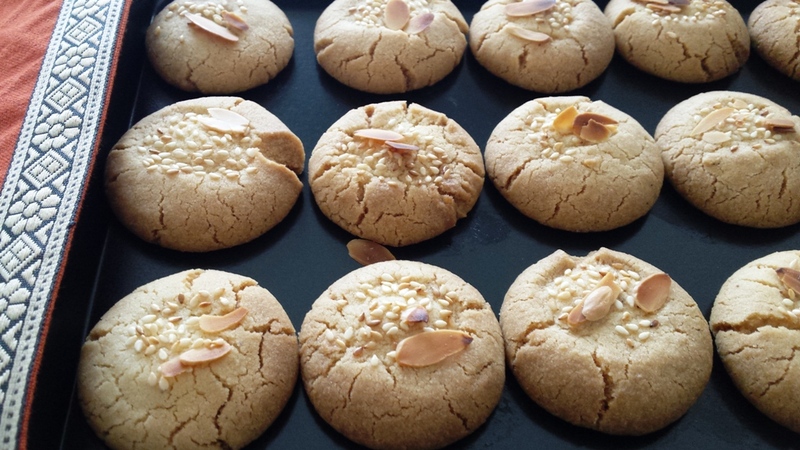 Press in the sliced almonds and sesame on the top slightly. Bake the Nankhatai in a pre heated oven at 180 degreesC for 15-20 minutes till light golden. Remove the Nankathai from the oven and place them on wire racks to cool. As the temperatures vary in different oven models, keep an eye while baking. If the Nankhatai are not baked enough after 15-20 minutes bake them for few more minutes. Other variations: If you fancy something different then check this out. I have used Sweet Mascapone cream cheese to sandwich the nankathai, but this is optional as nankathai is delicious on its own without any fillings. 3 Tbs light or dark Muscavado Sugar – I have used Muscavado sugar from Mauritius, but you can use any other type.